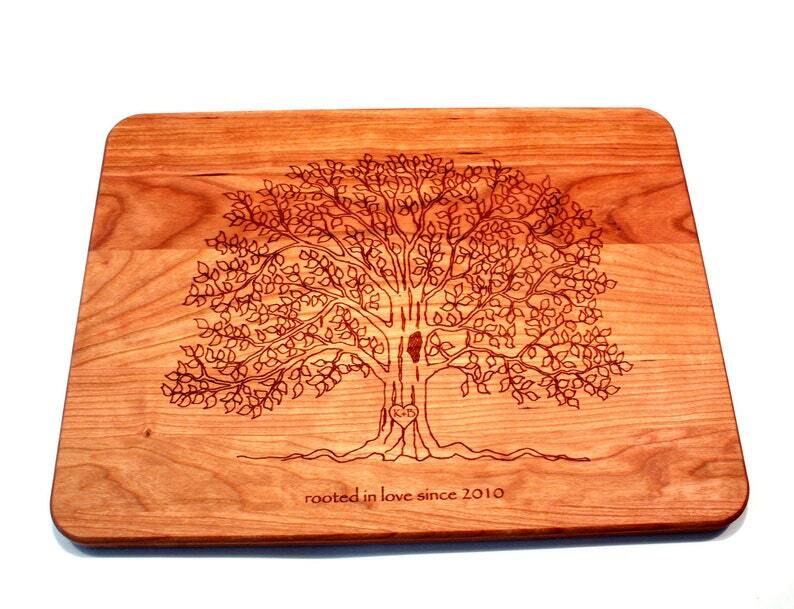 Our personalized cutting board makes a great item for a Wedding gift, Anniversary gift, Christmas gift, or just about any other gift giving occasion. We engrave the front of the board to allow it to be displayed when not in use. The back is left blank for use as a cutting / chopping board. The board is made from Cherry hardwood and measures approximately 16″ by 12″ and is 3/4″ thick. The finish is 100% FDA approved as food safe. We use our own special blend of mineral oil, beeswax and Carnuba wax to seal the board and give it a beautiful luster. It ships with care instructions in a nice white box suitable for gift giving and or wrapping. To order, place the item in your cart and proceed to checkout. During checkout leave your custom options in the “Notes to Seller” section. Date = 2001 or September 12, 2017. Be sure that they are formatted exactly as you want them engraved. If you are having us ship it directly to your recipient be sure to enter the correct ship to address. If you wish us to include a short note leave us that info as well and we’ll be happy to include that. Finish paying for the item and we’ll handle it from there. Your item will be made and shipped out via USPS Priority Mail in 5 to 7 days. Once the shipping label is printed you will receive an email containing a tracking number for your order.